Succulent ham cured and cooked for us by Oakleys of Flitton. Choose from unsmoked, smoked or molasses cured, a favourite with lovers of smoked and unsmoked alike. 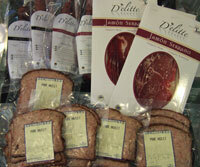 A small selection of specialities, including Serrano ham, chorizo and Sercombe’s Hazlet. Coming soon – home cooked cold cuts. Home reared, home cooked and some home smoked sliced meats for the salad season.